to wield a shotgun very well somewhere along Lhe paths he has traveled. In September, 1940, Jordan received an appointment to the Border Patrol branch of the U. S. Immigration and Naturalization Service. Early in his career he was assigned to Presidio, Texas, isolated deep in the wild, rugged, mountainous, Big Bend country. The small town nestled close along the unruly river on a narrow strip of farm land. From the hard, bare mountains surrounded by stretches of desert, valuable minerals were taken. A few ranches prospered in the valleys and on the less rugged slopes. It was a hard country, and it must have seemed definitely foreign to a boy from lire Deep South. Since then, Jordan lias served the Border Patrol from Mobile, Alabama, to Chula Vista, California, and from the Pecos River to the French Quarter of New Orleans. No matter what the geography, one factor remained constant: people do not like to be arrested. Some will kill to avoid it. Jordan is still going strong, but some others are not. Commissioned a 2nd lieutenant in the Marine Corps Reserve during World War II, he saw action at Enewietok and Okinawa. 1 pon release in 1946 with the rank of captain, the Air Medal, and eight other ribbons, he returned to the Border Patrol. By 1947, he was good enough to fire on a Border Patrol pistol team at the National Mid-Winter Pistol Matches in Tampa, Florida. He made it again in 1948 and 1949. July, 1950, brought active duty again for him and the Marine Reserve company which he commanded, and he was soon assigned to El Toro Marine Air Base as provost marshal. Upon release in the fall of 1951 he returned again to the Border Patrol. 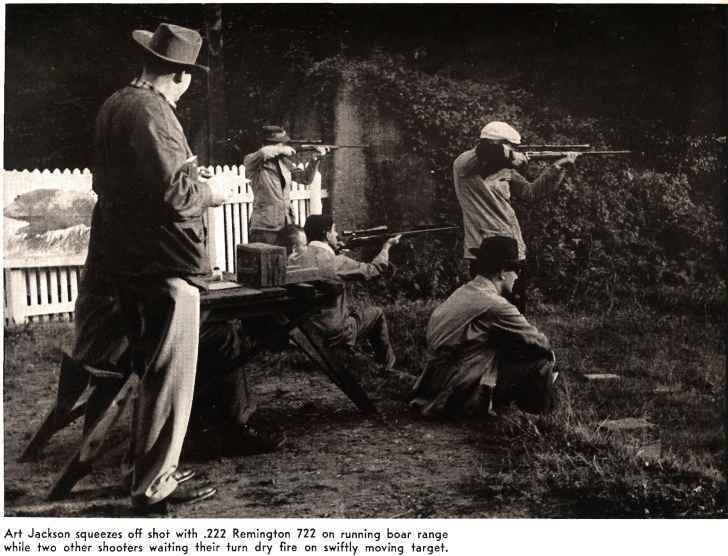 Then the rifle shooting began in earnest. He has fired on Marine Reserve rifle and pistol teams at the National Matches every year since 1952, inclusive, except 1955. Jordan was captain of a Border Patrol rifle team organized that summer and competing in the National Matches that year only. He was team captain in 1954 of the Marine Reserve rifle team which won the Roumanian Trophy Match, a 600 and 1000 yard slow fire event with match rifles. The same team also tied for second place in the National Trophy Team Match, the service rifle event at various ranges, and including both slow fire and rapid fire. As the years passed and Jordan continued to shoot, he acquired the Distinguished Marksman Medal and the rank of major. As for the fast draw accomplishments, this man is almost entirely self-made. He swaps ideas with other quick draw enthusiasts of all walks of life at every opportunity, but he has never had systematic, organized instruction in the art. He takes it very seriously. but it had to be an individual spare time project. With his inimitable mixture of wit and logic he explains it wonderfully well in person.